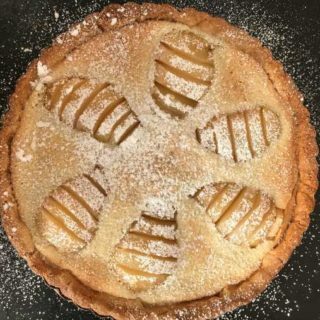 An elegant pear and almond tart baked in a 9 inch tart pan. Poach the pears. Combine water, sugar and lemon juice in a large saucepan and bring to a boil. Add the pears, reduce heat and simmer for 18 minutes or until pears are tender. Let pears to cool in the liquid, then remove them and refrigerator until ready to use. Make crust: Process powdered sugar, almonds, and salt in a food processor until nuts are finely ground. Add butter and process until smooth, scraping down sides of bowl occasionally. Mix in egg yolk. Add flour and pulse until dough comes together in clumps. Empty onto a clean surface and bring dough together to form a ball. Flatten slightly, wrap in plastic and chill for 3 hours. Alternatively, you could try pressing it directly into a 9 inch tart pan, covering with plastic and chilling for 3 hours (Other people have had good luck with this). Preheat to 375°F. Roll out chilled dough (it was stiff, so I had to let it come to room temperature on a floured sheet of parchment paper to 12-inch round, lifting and turning dough occasionally to free from paper (I just did it between two sheets of plastic. Fit the circle of dough into the tart pan, trim edges, then dock with a fork. Freeze for 10 minutes. Line crust with nonstick foil, nonstick side down, then fill with dried beans or pie weights. Make sure you cover the edges, as they brown quickly. Bake crust until sides are set, about 20 minutes. Remove foil and beans. Reduce heat to 350 and bake crust until for about 5 to 10 minutes longer or just until it appears dry and cooked through. Bake tart until golden and tester inserted into center of filling comes out clean, about 55 minutes. Let cool in pan on rack. Push pan bottom up, releasing tart from pan. (Can be made 8 hours ahead. Let stand at room temperature.) Cut tart into wedges; sprinkle with powdered sugar, if desired, and serve. I added a tiny dash (about 1/16 teaspoon) of almond extract and liked the results.